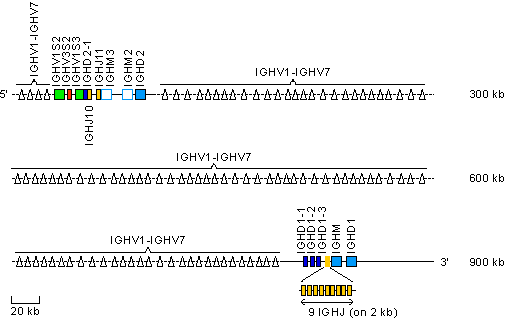 There are two clusters containing IGHV, IGHD, IGHJ and IGHC (IGHM and IGHD) genes (Greg Warr, personnal communication 13/06/2002). The IGHV genes belong to seven different subgroups. The IGHV gene number and organization are not known but the average distance between genes is about 3 kb. Ventura-Holman, T. and Lobb, C.J., Mol. Immunol., 38, 557-564 (2001). Ghaffari, S.H. and Lobb, C.J., J. Immunol., 162, 1519-1529 (1999). Ghaffari, S.H. and Lobb C.J., J. Immunol., 143, 2730-2739 (1989). Ghaffari, S.H. and Lobb C.J., J. Immunol., 146, 1037-1046 (1991). Warr, G.W. et al., Eur. J. Immunol., 18, 393-397 (1991). Ventura-Holman, T. et al., Mol. Immunol., 31, 823-832 (1994). Ventura-Holman, T. et al., Eur. J. Immunogenet., 23, 7-14 (1996). Wilson, M. et al., Proc. Natl. Acad. Sci. USA, 94, 4593-4597 (1997). Hayman, J.R. and Lobb C.J., J. Immunol., 164, 1916-1924 (2000). Hayman, J.R. and Lobb, C.J., J. Immunol., 164, 1916-1924 (2000). Hayman, J.R. et al., J. Immunol., 151, 3587-3596 (1993). Ghaffari, S.H. and Lobb C.J., Mol. Immunol., 29, 151-159 (1992). Magor, B.G. et al., J. Immunol., 153, 5556-5563 (1994). Wilson, L. et al., Proc. Natl. Acad. Sci. USA, 94, 4593-4597 (1997). Bengten, E. et al., Unpublished (2001).